To login to the company’s Performance Scoring application, first of all type in your company’s correct Performance Scoring URL. This will be (yourcompanyname.performancescoring.com). This will bring up your company’s Performance Scoring home page. Select the “User Login” button and this will bring up the company’s page. To loginselect “Email” and type in your designated company email. Likewise, select “Password” and type in your personal password. If you have forgotten your password, select “Forgot Your Password?” above login button. 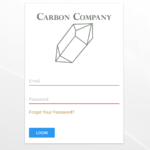 This will bring up a Reset Password prompt, type in your company email and select the send password reset link. You will be sent a reset password request via email. Once you have entered your email and password, select Login. Lastly, once logged in, the homepage will be you’re My Performance Score.